It is a big part of what political conventions are about: pumping up the base by painting the opposing party’s leader as the enemy. But in this case, the scripted insults have come after nearly eight years of vitriol that has left some Obama supporters convinced that the nation’s first black president has been treated differently from his predecessors. It has the makings of a delicate predicament for the handful of African-Americans sprinkled among the overwhelmingly white GOP delegates gathered at Cleveland’s Quicken Loans Arena. None of them are political supporters of Obama, but at the same time they feel a sense of pride that a black man occupies the Oval Office. Still, Harvey said he is not insulted by the harsh criticism and outright lies that have been hurled at the president by some of the most respected figures in his party. Former House Speaker Newt Gingrich called him the food-stamp president, and presidential nominee Donald J. Trump falsely labeled Obama a foreigner. White Republicans who vehemently oppose Obama say much the same. In an interview, Gingrich said Obama also is “fully capable of vitriol” and said that the president’s rhetoric pointing out inequality and racial disparities has divided the nation. He added that the food stamp crack about Obama — a regular feature of his failed bid for the GOP presidential nomination in 2012 — had nothing to do with race. 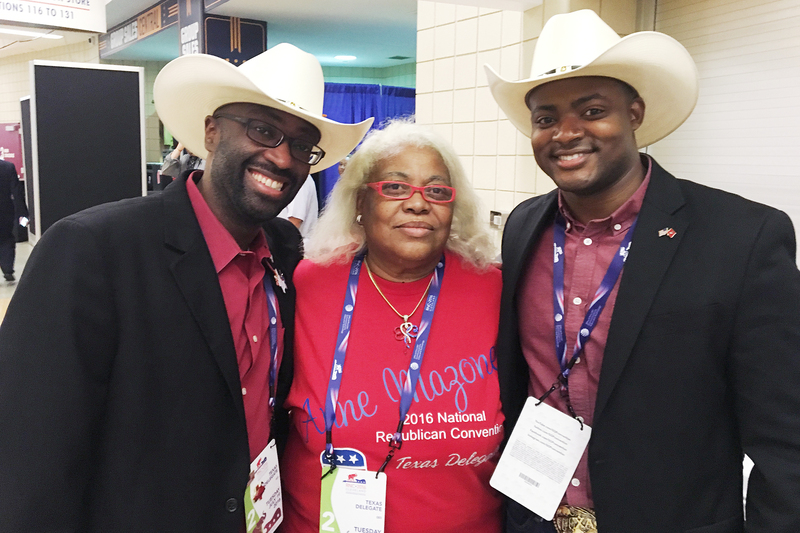 Texas delegates Christopher Harvey (L), Anne Mazone (C) and Reginald Grant. That remark, like others directed at Obama during the convention, left Harvey and several other black Texas delegates unruffled. They pointed out that black Republicans are often treated far worse by other African-Americans. Some pastors block Republicans from their pulpits, they said. Frequently, they have their racial bona fides questioned because they are not Democrats. Meanwhile, they noted, some of the most accomplished black Republicans in the nation, from former Secretary of State Condoleezza Rice to Supreme Court Justice Clarence Thomas, have been parodied as house Negroes and Uncle Toms. “Just because we’re all black it doesn’t mean we have the same opinions,” Harvey said. Anne Mazone, 70, a retired teacher’s aide, was born and raised in Navasota in the central Texas Brazos Valley. She never thought she would see the country led by a black president. But when Obama came along, she could not bring herself to vote for him, although she came close. Reginald Grant, 29, a black delegate from Houston who works as a public school teacher, said that when Obama first ran for president he was swollen with pride. At the time, he was a Republican, but he voted for Obama in a show of racial solidarity. But he was quickly disappointed. “Initially, it felt great that what your parents tell you, that you can be anything you want, even president, was actually proven to be true,” Grant said.